I'm sure by now we've shined the light on enough Philips Hue deals for you to know all about the WiFi connected bulbs. I mean, you're a bright bunch, I don't think I can really illuminate any new details about the system that you haven't read before. If you've had even the dimmest impression that you'd like to try a smart lighting system, then you really should take a look at the deal Best Buy has going on right now. 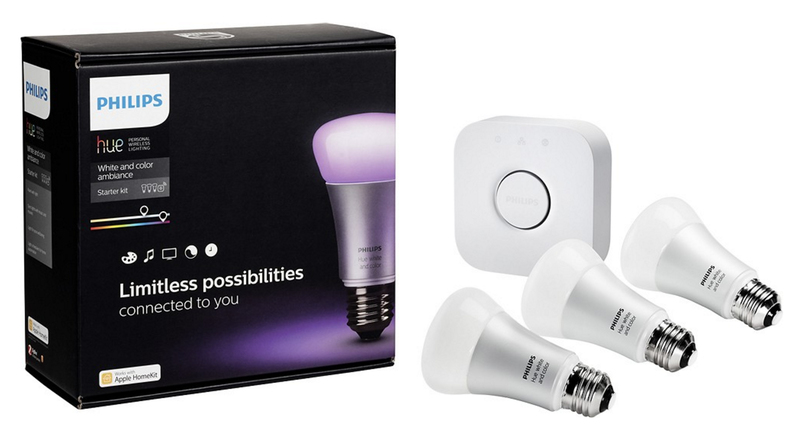 You can grab a Philips Hue 2nd Gen Starter Kit for the glowing price of just $94.99 – a price which is a lot lighter on your wallet than the normal $180. It's also half the price of the newer third gen bulbs, which don't have any additional feature, but do produce more vibrant greens and blues. Who needs green light anyways? The advertised price on Best Buy's site is $120 for the kit, but the price fades another $25 at the time of purchase when you use VISA Checkout. VISA Checkout is a free service that stores your credit card number making it easier to complete transactions at a wide spectrum of retailers where it is accepted. You can sign up for free in just a couple of minutes. It's well worth your time to take advantage of this brilliant offer (which you may have just read about here). If you're interested, go ahead and head on over to Best Buy to buy a kit for yourself. Already have one? You might consider picking up another set, it would make a dazzling gift that is sure to leave its recipient beaming.